Moses, 26, said when he daydreams about what he would do if he won, it includes a lot of investing. He isn’t alone in thinking about how the fortune would change his life, and the state of Oklahoma depends on these dreamers to buy tickets to support the beneficiary: education. Some lawmakers and the Oklahoma Lottery Commission, however, say the program fails to reach its full potential because requirements on how to spend the gross proceeds limit the size of the payout. To that end, HB 1837 aims to restructure the Oklahoma Lottery in an effort to increase payouts and, as a result, sales. Doing so would mean more funding for education, advocates say. The bill also includes a cap on overhead expenses intended to ensure spending on salaries does not increase with revenue. Without passage of HB 1837, the Oklahoma Lottery Commission expects to lose $25 million designated for education in the coming years. That anticipated funding loss is based on the state’s steady decline in lottery participation. Oklahoma’s state-run games of chance started in 2005 on the notion they would help fund the future of education, but overestimations, decreasing state revenue and, most recently, supplanted funds have left residents wondering if the lottery makes any meaningful impact on education. When former Gov. Brad Henry first introduced the plan to use a state lottery to increase education funding, he said it could contribute nearly $300 million to education annually. The bill’s final version, however, excluded certain types of online gaming. As a result, some lawmakers predicted it might not reach $100 million. Over the past 12 years, the lottery has supplied no more than $70 million annually. In 2016, it dipped to $57.2 million. Jay Finks, director of marketing and administration for the Oklahoma Lottery, said the lottery payout that triggers someone to buy a lottery ticket varies from one individual to the next, but generally it is much higher than the $100 million Moses prefers. “The higher the jackpot, the more people play,” said Finks in a phone interview. “Last year, when the jackpot was the largest in the history of lotteries, in the two-week window we did $30 million extra in sales. Many cite a 35 percent profit requirement designated for public education as the reason the Oklahoma Lottery cannot compete with other states. “If you look at the national average for payout, we are just not giving players the experience they are used to having in the states around us,” said Finks. 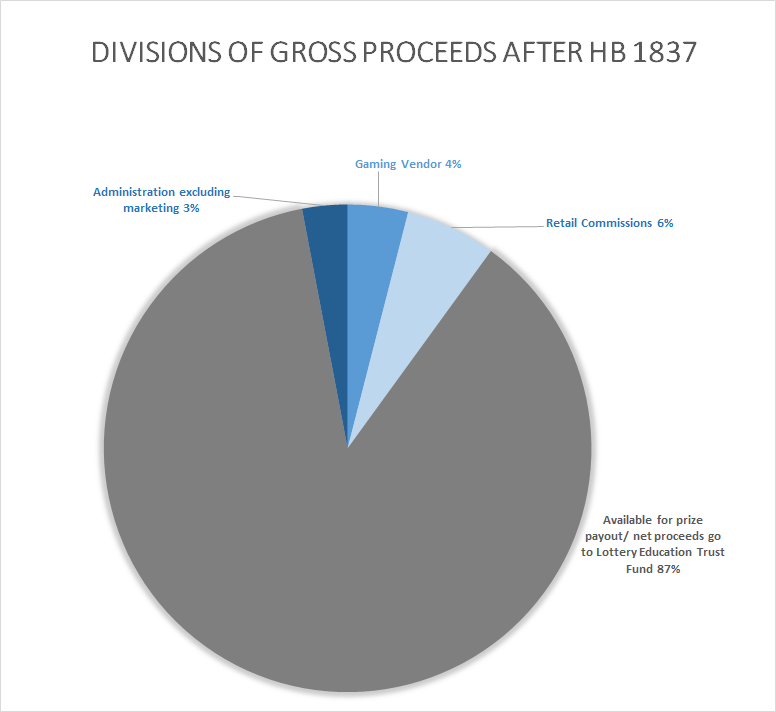 HB 1837 is based on national state lottery trends and would adjust the current formula by removing the 35 percent trust fund requirement and replacing it with a new mandate. The new mandate would send the first $50 million of net proceeds to the Oklahoma Education Lottery Trust Fund. Any additional net proceeds would be sent to a separate fund designated for creative learning initiatives in reading and science, technology, engineering and math (STEM) programs. “Statistical data from other states that changed the percentages that could be spent on prizes showed that the lottery would bring in $15-20 million more per year if changed as they were,” stated House Appropriations Chairwoman Rep. Leslie Osborn (R-Mustang), the bill’s author, in an email. Shawn Hime, executive director of the Oklahoma State School Boards Association, said the new bill’s $50 million guarantee each year makes it a win-win for both the Oklahoma Lottery Commission and schools. Some lawmakers oppose the lottery on the basis that it has negative moral implications and targets lower-income residents. Rep. Todd Russ (R-Cordell) debated against the measure both in the House Appropriations and Budget Committee and on the House floor. Osborn responded during the meeting that HB 1837 works to improve a system lawmakers and voters already approved. Furthermore, she said the change would not encourage more gambling but rather increase participation through individuals who already play the Oklahoma Lottery. After being assigned a committee, the Senate will likely hear HB 1837 sometime next month. The bill passed the House 70-25 on March 7. “This bill already passed the full House with broad acceptance, and I expect it to fare well in the Senate,” stated Osborn via email. 1994: The state fails to pass State Question 658, which would have created a state-run lottery. It designated 50 percent for prizes, 35 percent for the state and the remaining funds for capital needs for education. April 2003: HB 1278 and Senate Joint Resolution 22 established the lottery. Nov. 2, 2004: Voters approve SQ 705. It designated the state lottery, and, this time, 45 percent minimum goes toward prizes while 35 percent goes to the Lottery Education Trust Fund. The measure received 64.68 percent in favor and 35.32 percent against. The legislation mandated that fund should never supplant or replace education appropriations. 2017: Legislators must replace $10 million of supplanted funds before completing the appropriations process. The phrase, “Less of more is better than more of less,” began when Massachusetts changed the structure of their lottery system to provide higher instant-prize payouts in 1984. Incremental increases in the payouts resulted in higher net profit for beneficiary programs, making Massachusetts one of the most successful lotteries in the country. Finks said if the bill passes, the percentage designated for education could shrink to about 30 percent and eventually about 25 percent. Although he anticipates a smaller percentage, he predicts a larger dollar amount, meaning about $110 million more for creative learning initiatives over the next five years and a guaranteed $50 million processed through the original formula. “Very simple: You take that five percent, you apply it to prizes, that would raise the sales to a point where, even though there is less of a percentage, there is more money,” he said. This is exactly what happened in North Carolina, a system Finks said the Oklahoma Lottery Commission seeks to emulate. North Carolina also had a 35 percent profit requirement. After eliminating it, even though the percentage contribution to the beneficiary dropped to 26 percent, total beneficiary dollars increased. Denton did mention the state had introduced new games since 2007, which also influences sales. Finks said the higher payouts will affect instant games, which are the scratch-off tickets. Currently, Oklahoma lacks a scratch-off game over $5. If the bill passes, Finks said the Oklahoma lottery would almost immediately have a $10 ticket and eventually a $20 ticket, which are popular in other states around the country.